Insider threats and cyber threats are on the rise but still many corporations have not devised adequate programs to protect their assets. Finding the right professional to mitigate these dangers may seem at times like wandering through a wilderness, but Benchmark, led by the talented Jeremy King, has proven to an outstanding leader in this growing field. With its unparalleled network in both the private sector and the US Government national security arena, Benchmark matches the most qualified and suitable professionals to the exact corporate position. Most importantly, Benchmark assists both sides in understanding the different cultures of government and industry and thus makes the transition as smooth as possible. In my dealings with national security professionals, no competitor eve comes close to Benchmark’s excellence in executive search. 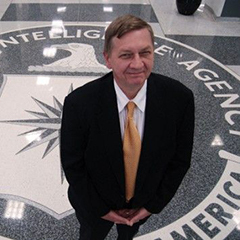 After a twenty-eight year career, Michael Sulick retired from the Central Intelligence Agency (CIA) in 2010 as the Director of the National Clandestine Service (NCS). As Director NCS, Mr. Sulick was responsible for coordinating the espionage activities of the US Intelligence Community and managing global covert operations on terrorism, weapons proliferation, and regional and country-specific issues. Mr. Sulick held a number of other senior positions in the clandestine service both at CIA headquarters and overseas. In 2004 he served as the deputy in CIA’s Clandestine Service. Prior to that, as chief of CIA counterintelligence, Mr. Sulick strengthened collaboration with the FBI on major espionage cases. A specialist in Russia and Eastern Europe, Mr. Sulick was chief of the Central Eurasia Division responsible for intelligence collection operations and managing foreign liaison relationships in Russia, Eastern Europe and the former republics of the Soviet Union. Overseas Mr. Sulick served as the senior CIA representative in Russia and Eastern Europe where he managed operations and foreign intelligence relationships during an era of dramatic post-Cold War change. Earlier in his career he served at locations in the former Soviet Union, Asia and Latin America. In 1991 he was the first CIA officer to enter the Soviet Union to forge new relationships with intelligence services of a newly independent former Soviet republic. In retirement Mr. Sulick has served as a national security consultant to US and foreign corporations and lectured on intelligence topics at various universities and public forums. Currently he is a senior partner in Threat Pattern, an intelligence and security company specializing in insider threats. He speaks Russian, Polish and Spanish and has written about intelligence issues in CIA’s Studies in Intelligence, the Los Angeles Times and Cipher Brief. He is the author of Spying in America: Espionage from the Revolutionary War to the Dawn of the Cold War and American Spies: Espionage against the United States from the Cold War to the Present, both published by Georgetown University Press. A native of New York City, Mr. Sulick earned a Ph.D. in comparative literature from the City University of New York and an M.A. and B.A. in Russian Studies from Fordham University. He also served in Vietnam with the U.S. Marine Corps.